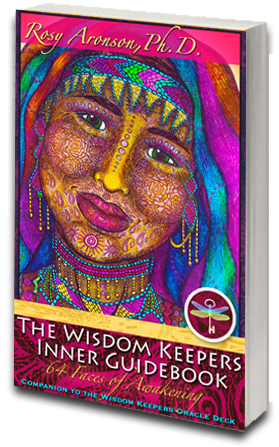 The Wisdom Keepers Inner Guidebook, now available on AMAZON! that accompanies The Wisdom Keepers Oracle Deck, also now available on AMAZON. Also available on Kindle! For more information, click here. The Wisdom Keepers Inner Guidebook welcomes you into the gaze of the 64 Faces of Awakening, each here to recognize your worth, reflect your beauty and love you unconditionally. The Wisdom Keepers share their teachings through intimate stories, contemplative questions and practical suggestions for how to access your wisdom, open to your gifts and fulfill your potential. The Wisdom Keepers Inner Guidebook is best used with its companion, the magical Wisdom Keepers Oracle Deck. Both are empowering tools of self-acceptance, understanding and healing. Rosy has joined her 64 Faces of Awakening with archetypal themes and concepts found in the 64 hexagrams of the I Ching and explored in Richard Rudd's profound visionary book, The Gene Keys. Now available on Kindle! (can be read on free Amazon Kindle apps on any computer, tablet or smartphone). For more information, click here.